At address, my right foot points perpendicular to the target line, but my left foot flares out almost thirty degrees to the left. That's a lot. The reason I do this is that it helps me get my left side out of the way and turn fully through impact. The flip side of this is that the flared-out left toe restricts my hip turn away from the ball and thus limits the length of my backswing. That's not a liability for me, however, because I've been blessed with a supple body. If you have trouble turning through the ball, I recommend that you experiment with this flared left toe. Just be careful not to allow the alignment of your feet, hips, and shoulders to open. 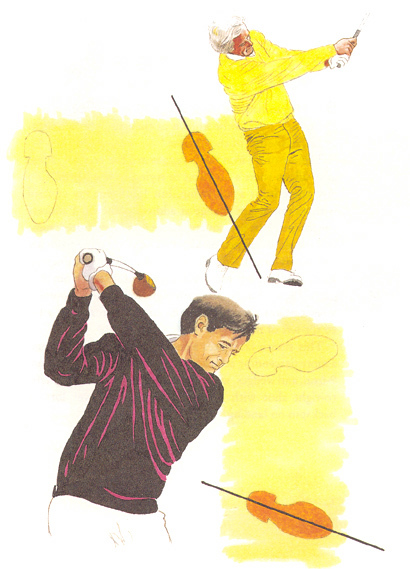 Conversely, if you want to make a more full and free turn on your backswing, try experimenting with a flared right toe. Just bear in mind that this can inhibit your turn through impact.